We will periodically update this gallery with interesting things we notice around the farm throughout the season. Our alpha hen, Chunky, with our new chick. Chunky is a patient and protective mom. We are nearly positive our new chick (about 36 hours old here) is a Cuckoo Maran (hen) x Delaware (rooster). The chick has the coloring of a Cuckoo Maran chick, and we believe the yellow patch on the head means we have a soon-to-be pullet. We work to create welcoming places for pollinators. Once they're lured into the gardens, they can't resist nightshade and cucurbit blossoms. 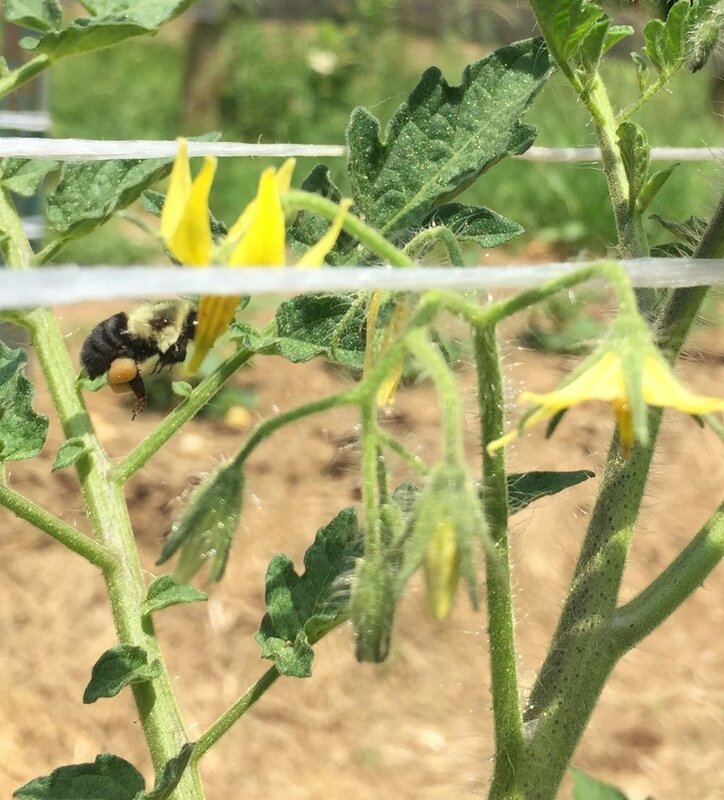 This bumblebee (possibly Bombus impatiens) is sporting full pollen sacs from some other source, but it visits the tomato blossoms and agitates them thereby helping to set fruit. The result is strong fruit set. 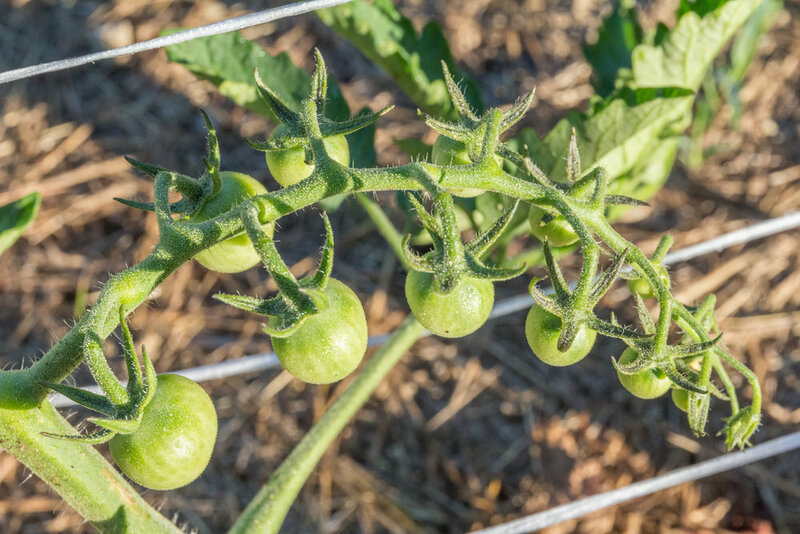 Although tomatoes can wind pollinate, we believe pollinators ensure more uniform fruit set and full clusters. This Eastern Tiger Swallowtail (if I have misidentified, please let me know) is a new addition to our pollinators. We have seen the diversity and number of pollinators increase quickly over our first two years. This sweat bee (again, please let me know if I have misidentified) is another new addition to the pollinator flock. It has an impressive metallic green head and torso. Our Music and Metechi garlic matured about two weeks early this year, so it will be cured by the end of July. Until then, the barn smells incredible. Baby kale is one of our favorite crops. It has the eating quality of lettuce with the nutrition profile of kale. And it's beautiful. We train our indeterminate cherry tomatoes to two or three leads in a weave trellis. All photos by Two Pines Farm. Non-commercial use permitted with attribution.